In "Dancing Scissors" I have used scissors rather than brushes or pencils or pens to create the dancers. 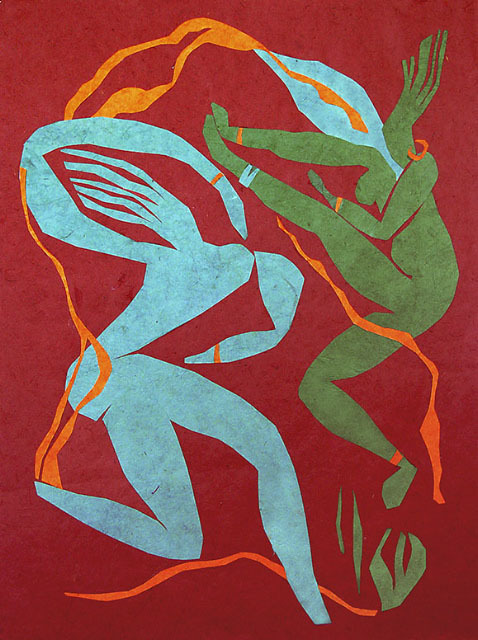 My intention in cutting the dancers out of colored paper is to keep the dancers as spontaneous as possible while generating large colorful shapes with strong, very crisp edges. To "keep myself on my toes" -- to stay as spontaneous and fresh and improvisational as possible -- I do not draw the dancers first and then cut on drawn lines. Rather I cut directly into paper, letting the scissors move freely and quickly. Then I place the cut pieces onto a background sheet and move them around, sometimes re-cutting, sometimes adding new elements like a ribbon, sometimes painting layers of color with a dry brush, until everything finds its own proper shape, movement, balance. When all the elements feel "right", I glue them down. What I love most about this way of creating dancers is the many surprises that occur in the cutting of the paper and the re-positioning of the shapes. For many years I have been drawing and painting dancers, both those human dancers who leap and twirl in studios and those weightless dancers of all shapes and sizes who inhabit my imagination.